A number of Israeli rabbis have said that the spreading unrest in the Arab and Muslim world may signal the long-awaited coming of the Messiah. Christians, who believe that the Messiah has already come in the form of Jesus (Yeshua), can also find many reflections of Biblical prophecy in current headlines. Chaim Kanievsky, a Lithuanian Orthodox rabbi who is believed by his followers to have mystical powers, said, “"It is evident that many unnatural things are happening. People have come to me and said that it's 'Gog and Magog'. We cannot know. But it's probable that any unrest that God creates shows that the Messiah is coming, and that we must begin to prepare for it and become stronger." Much of the focus on the Arab uprisings stems from a Biblical prophecy of Ezekiel regarding the future War of Gog of Magog. In the prophecy (found in Ezekiel 38-39), a coalition of nations is led by “Gog, ruler of Rosh, Meschech, and Tubal” in an attack on Israel. Although the names of the nations listed in the prophecy are antiquated, most are generally believed to refer to modern day Arab and Muslim nations. One nation that is easily identified is Persia, which is the historic name of Iran. Modern Iran is pursuing nuclear weapons with which to destroy Israel. The current wave of revolutions sweeping the Arab world may eventually bring nations that are now ruled by secular dictatorships and monarchies under the sway of radical groups like the Muslim Brotherhood. Where the secular governments have realized the folly of directly confronting Israel, newly radical governments might take the success of their revolutions as a sign of Allah’s favor and be more inclined to join in an attack on the predominantly Jewish state. The War of Gog of Magog will be different from previous Arab-Israeli conflicts which have been settled by conventional means. According to Isaiah, the coming war will be won by divine intervention. In 38:19, Ezekiel describes an earthquake followed by a rain of fire and ice from the sky in verses 21-22 as Gog’s troops turn on each other. This bombardment from Heaven will totally destroy the attacking forces. Chapter 39 describes the aftermath of the attack and the carnage inflicted on the attacking armies. In Christian theology, the War of Gog of Magog is typically thought to occur before the second coming of Jesus Christ. It is possible that the utter destruction of the militant Islamists in the Middle East will make it possible for the Jews to construct a replacement for their temple in Jerusalem. 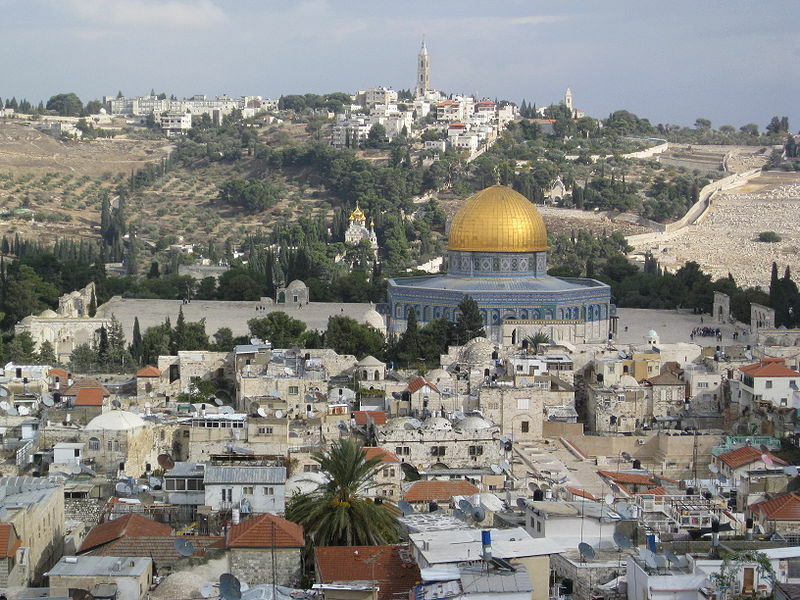 The last temple was destroyed by the Romans in A.D. 70 during the First Jewish Revolt. The Biblical book of Daniel describes a latter-day stoppage of sacrifices at the temple (9:27, 12:11). Jesus refers to these verses (Matthew 24:15-16) in response to a question about his return and the end of days. The prophecy of Daniel was partially fulfilled by Antiochus Epiphanes when he defiled the altar of the temple in 168 B.C. Obviously this is not the ultimate fulfillment because Jesus was speaking of future events and Antiochus’ actions had occurred over 150 years earlier. The traditional site of the Jewish temple in Jerusalem is now occupied by the Muslim Dome of the Rock mosque. The mosque is currently protected by the Israeli government even though Jerusalem has been under Israeli control since Egyptian dictator Gamal Abdel Nasser’s disastrous Six-Day War on Israel in 1967. Any attempt to remove the mosque to rebuild the temple would undoubtedly spark a holy war. If the mosque were destroyed as a result of the divine intervention against Gog, however, it might well provide an opening for Jewish Israelis. Interestingly, the chapters of Ezekiel following the Gog prophecy contain a description of a new temple that has so far never been built. Along with a defilement of the temple, Jesus also says that signs of his return will include earthquakes and famines. The recent Japanese earthquake ranked as the fourth largest of all time by magnitude. Of the nine strongest earthquakes in history, four have occurred within the last decade. With respect to deaths, only two of the top ten earthquakes (Haiti in 2010 and Sumatra in 2004) have occurred in the past decade. Likewise, world food prices have risen sharply over the past few years. The rising cost of food is a factor in the Arab uprisings and is already causing a food crisis in the poor nations of the world.